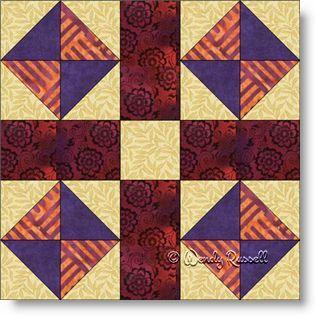 The Broken Dishes Cross quilt block is a simple 10 inch selection that is a great choice for the beginner quilter, as it contains only squares, rectangles and half square triangles. Don't let the simplicity of the block limit you if you want a challenge. Challenges can be created in your choice of colour palette, without restricting yourself to the number of fabrics shown here in this block. The sample quilts illustrated show how very different your quilt can be just by choosing a different setting. Enjoy the process.